There I am, laying on the couch battling the WORST. COLD. EVER., when I receive a press mail in my inbox introducing the newest Essentiel S/S '15 Flash collection named Can't Talk, Gone Fishing. 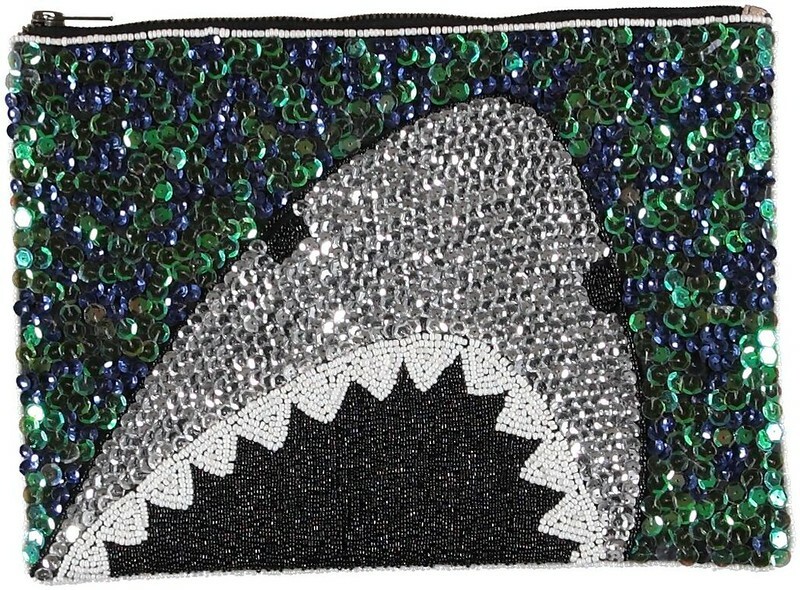 I have always loved Essentiel for their fun prints, bright colors and excessive use of rhinestones and sequins and I love them even more now... Because they have a Shark clutch! Judging by the name of my blog, it's needless to explain why I'm so excited -- but I'm going to do it anyway in a nutshell: I love sharks because they have been roaming the oceans and seas for millions of years, they are some fierce creatures and unfortunately often very misunderstood. It's my dream to swim with them one day. Anyway, this isn't a biology blog so I'm going to shut up now. Conclusion: this clutch, I need. The Flash collection will be available from 18/04 in all Essentiel boutiques and online. This clutch is awesome! I love the sequins and color, really nice blog, glad I could follow you on GFC! My best friend would LOVE that clutch.. SO much! Great post. This is fabulous and I do hope you get to swim with sharks someday--safely that is!! Hope your are feeling better! Echt heel leuke clutch en past perfect bij de shark attack blog! Ik vind Essentiel zowieso een geweldig leuk merk met mooie tasjes en accessoires! i love this so much :)) you have such a wonderful blog! Sharks are my favorite animal so I LOVE this! Love this your post, because it's really amazing! Great job! Will wait for a new one!